This article was initially published in Ahram Online on 11 February 2012. It is an amended version of the article entitled 'SCAF: A brief history of injustice' published 10 November 2011. Republishing it today in remembrance of past injustices at the hands of Armed Forces as they continue under the Muslim Brotherhood. A year has passed since the military assumed power when president Hosni Mubarak was ousted in February last year. But is Egypt any closer to the freedom and justice it sought when its people rose up against the Mubarak regime? The ruling Supreme Council of Armed Forces(SCAF) has implicitly acknowledged some injustices committed since it took the reins of power. The military council for instanceissued an apology to Egyptian women after a furore surrounded the part-stripping and beating of a female protester by military soldiers. Prime Minister Kamal El Ganzouri also acknowledged that the victims of the Maspero massacre in October and the confrontations in Mohamed Mahmoud Street in November were indeed martyrs of the revolution. The head of the military judiciary announced on 13 October that the armed forces alone would investigate what is known as the Maspero Massacre— the clashes that took place 9 October, leaving 28 people dead and at least 325 injured, when Coptic Christians marched from Shubra to the State TV building at Maspero to protest the burning of a church in Aswan. The announcement came despite warnings by human rights groups that the killing by the military of Coptic protesters should not be covered up and must be subject to independent and open investigations. In spite of these acknowledgements and decisions, no army or police personnel have as yet been held accountable for their actions. This may be due to a fear that if some are convicted, others may not follow orders in the future. Since the military assumed power the investigations conducted under its reign have fallen short of standards of open and transparent scrutiny. There are over 15 major incidents that still need to be properly investigated Many other charges of misconduct and abuses filed before and after military rule have also not been dealt with. Mass protests in response to the Port Said football clashes took place in the vicinity of the Ministry of Interior on Mohamed Mahmoud Street and in the city of Suez. At least 15 people were killed as police responded by heavy use of tear gas and birdshot. Even after walls were erected around the ministry, police attacked protesters chasing them into Bab El Louk. 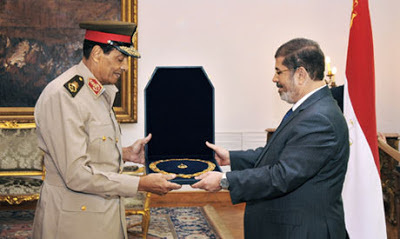 The Minister of Interior, Mohamed Ibrahim, claimed much like his predecessor Mansour El Essawy that no shots were fired. At least 74 people have died in football clashes on 2 February in the city of Port Said following a match between Ahly and Al Masry football teams. Witnesses hold the police responsible for having failed to secure the match. There are accusations of gross negligence and some activists have accused the ruling military council of instigating these clashes. Parliament is currently overseeing investigations. A military crackdown on a sit-in outside the cabinet buildings resulted in 19 killed and 750 injured. Around one hundred of 250 arrested remain in custody; of the released 70 were minors. The events started on 16 December and continued throughout 17, 18 and 19 December making it the longest period of direct military-led violence against protestors since the revolution started. The period also produced the most scathing body of video evidence incriminating the military, filmed mostly by citizen journalists. The most notable exampleof this violence caught on camera was of the female protester in Tahrir who was part-stripped, beaten and dragged by military forces. In their press conference the SCAF spokesperson said that the incident was under investigation. The Mohamed Mahmoud Street clashes which took place between 19 and 25 November left 41 dead and over one thousand injured, according to the Egyptian Ministry of Health. Despite the presence of incriminating video evidence, the minister of interior denied that forces had fired any ammunition of any kind at protesters. One video shows a truce broken unilaterally by Central Security Forces (CSF). Both doctors and journalists were targeted in the events of Mohamed Mahmoud. The onslaught of attacks on protesters by the police was not preempted despite evidence of targeting protesters in the eye and public pressure. There have been no serious investigations into the actions of the army or the police. On 27 October 2011, 24-year-old Essam Atta was reportedly tortured to death by prison guards. Despite Atta’s family testifying that a prison officer called Nour was involved in Atta’s torture, the police have not investigated these allegations and concluded that Atta died as a result of ingesting drugs. The Ministry of Interior statement and the forensic report are reminiscent of the official story on Khaled Said, who was murdered in plain view and whose autopsy report had been falsified. The case is currently being examined by the general prosecutor. Despite these implications, (SCAF) insisted on conducting investigations alone and ended by exonerating the army. Instead of a full-fledged investigation, revolutionary activists have been summoned to appear before the military prosecution. Activist Alaa Abdel Fattah was detained by military prosecution on serious charges yet no evidence has been presented to the public. General Mohamed El-Assar claimed that army personnel were unarmed and yet one of the charges against Abdel Fattah is theft of a weapon belonging to military forces. In addition, according to Bahaa Saber, another activist who was summoned but released after questioning, the army has Mina Daniel’s name on the list of those accused. Mina Daniel was one of the activists killed on 9 October. His autopsy reports the cause of death as: “projectile entered into the upper chest, exiting the lower back”. No justice has been realised in cases like the killing of protesters, the Battle of the Camel, the bombing of the church in Alexandria and many others. Nobody has been held accountable to numerous incidents as SCAF chooses to turn a blind eye to these crimes. What a sad world we have today.